Every time I see the words “free food” and a picture of a Sikh next to a “Hello Langar, Goodbye World Hunger” banner a part of me dies. It evokes a rage in me that is usually reserved for the worst violators of panthic fidelity. Rather than tweet profanities to express my discontent and lament in closed circles about the degradation of yet another Sikh institution for social media hype and validation, I’m compelled for posterity to explain why langar cannot be equated with “free food” and why “Langar Week” will not end world hunger. English speaking ‘Sikh educators’ are at the centre of perpetuating the idea that langar translates to “free food”. The campaign is centred on the idea that an individual Sikh should engage in the act of giving people free food by inviting people (generally white people and the local media) to the Gurdwara for a “free vegetarian meal.” This altruistic bid to end world hunger and create a positive Sikh image through the resulting “awareness” is, at best, a complete over simplification of even the most basic idea behind langar, and at worst a well thought-out marketing idea to capitalise on an ‘undersold’ aspect of Sikhi. The idea that merely donating food to the needy is a “good” action isn’t a Sikh one. In fact it is an idea that the Guru constantly challenged. It creates the exact kind of passive, feel-good, pseudo-altruism that the house of Nanak sought to abolish. The Guru evokes a sense of innate divine power within the people of Punjab so that they would tear down oppressive power structures to create a truly egalitarian society; we’re here to destroy the status quo not provide it with a free meal service. Through pilgrimage, prayer, charitable deeds, what profits are you trying to earn? Langar does not exist in a vacuum. One of the oldest Sikh sayings is ‘Degh, Tegh, Fateh‘ – ‘The Cauldron [commensality,] The Sword, Victory‘. Langar is the foundational Sikh revolutionary space. 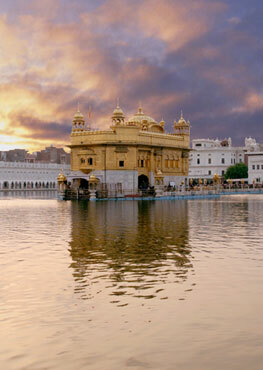 It’s where Sikhs come together to discuss the revolutionary ideas of the house of Nanak. It’s a safe space for all the oppressed people of the world, to share a meal with the Khalsa and learn about our revolutionary struggle so that they too can take part; it’s not a passive space where you come to observe and have a free meal. Under the canopy [of rule] the Gurmukhs attain a supreme state bestowed by the Guru. This ideological understanding of langar and its purpose in Sikhi is borne out by history, with one particularly telling account of how langar fits into Guru Nanak’s revolutionary struggle. When I was a child I grew up hearing stories that shaped how I see langar as a foundational institution of the Guru and my favourite story was set during the early 1920s Gurdwara Sudhar Lahir (Gurdwara Reform Movement) and the Guru Ka Bagh Morcha of 1922. The ਮੋਰਚਾ (morcha – agitation, front, military position) of the Sikhs at Guru Ka Bagh was centred on their desire to access the historic forest area that formed the ਜਗੀਰ (jageer – estate) of the Guru. The ਮਹੰਤ (mahant – priest) that had controlled the local Gurdwara wanted to retain this tract of land as his personal property and he complained to the British colonial agents that Sikhs were entering the ਬਾਗ (bagh – tract of land, garden) and cutting down trees. We were. They were our trees, used for centuries as firewood for the langar at Amritsar and the surrounding Gurdwareh. British colonial officers worked in collusion with the corrupt mahants to destabilise Sikh power by taking control of Gurdwareh and violently suppressing any Sikh political activity. The officers of the colonial regime began to arrest anyone who entered the bagh. So the Sikhs gathered at Akal Takht and decided that everyday a fresh band of Sikhs would go to the bagh to gather firewood; if stopped they would continue, if attacked they would not retaliate. The British in all their colonial wisdom decided to brutalise anyone who dared approach the bagh and began yet another infamous episode in their colonial exploitation and oppression of Punjab. Everyday a new band of Sikhs were beaten with rods and rifle butts, many were arrested and fined. One such band of revolutionary Sikhs, made up mostly of ਬਜ਼ੁਰਗ (bazurg – respected elders) were arrested, tried, fined and placed on a train to be taken from Amritsar to a prison in Attock (now part of northern Pakistan) to serve a two and a half year sentence. We remember what happened next, on 31st October 1922 as ਸਾਕਾ ਪੰਜਾ ਸਾਹਿਬ (Saka Panja Sahib); ਸਾਕਾ (saka – historic event where rare courage and valour was displayed.) This saka displayed the indomitable spirt of the Sikhs in a unique and explicitly Sikh way. It personified and made tangible the sovereignty of mind and body that was bestowed upon the downtrodden people of Punjab when they became the Sikhs of the Guru; it displayed the transformation of an individual Sikh into a member of the Khalsa Panth and the price we will willingly pay for the love we bear for the Guru and his beloved Sikhs. When the Sikhs that lived around Panja Sahib heard that the train carrying the prisoners from the morcha would be passing through the nearby town of Hassan Abdul, they gathered at the station in the early morning with langar. They were told by the colonial station officer that the train would not be stopping and that they were wasting their time. The gathered Sikhs asked the agent of the occupier if the train could be stopped briefly so that they could serve langar to the elders. As all requests made to the oppressor, this one too fell on deaf ears. Bhai Karam Singh (in his late twenties) sat down on the tracks. It is recorded that Bhai Karam Singh said, “Guru Nanak stopped a boulder with one hand, there’s so many of us here today, we can easily stop the train“. Bhai Partaap Singh (aged 24) sat down next to him. My parents told me that before long Sikhs were fighting to sit at the front near Bhai Karam Singh and Bhai Partaap Singh. Mothers were sitting down with their children. As the train approached the Sikhs were shouting jaikareh; like all machinery of the oppressor it only stopped when it couldn’t get through the mangled bodies of those that resisted. ‘Awareness’ wouldn’t have made a difference, neither would our promise to end world hunger, nor leaflets explaining our ‘universal values’ and what ‘good’ people we are. Reducing langar to “Langar Week” embraces the status quo and furthers racist, imperialistic ideas deeply rooted in colonialism. It says “come and eat for free, we’re good people, here read this leaflet and see how nice we are.” The constant desire for validation and justification of our existence is sickening. “Langar Week” screams “we deserve to be here, we’re just as British as you, we feed six million people a day, don’t hurt us, we helped fight for freedom in the (read: your) world wars”. Our role as Sikhs isn’t to fix the broken people that capitalism churns out as a by-product of its economic model. We’re not neo-colonialism’s personal clean up crew. At what point do you ask yourself what the purpose of langar truly is? It has to go beyond “langar is the free meal service found in every gurdwara,” and “hello langar goodbye world hunger.” These aren’t Sikh ideas, they’re marketing slogans. “Langar Week” is a capitalist response to a problem created by capitalism. The term “Langar Week” represents the death of an idea by commodification; tackling the root cause of these problems is too hard, so here’s a bite sized version that you can engage with at your leisure, one week a year. To embrace the reality of langar is to embrace the reality of our destiny as rulers. Only then can we truly end world hunger and build Halemi Raj.